The cultivation and export of roses and other flowers is a huge business in Colombia. About 40 years ago, the American and Colombian governments began to encourage growing flowers as an agricultural export that could provide farmers a viable alternative to crops with greatly fluctuating prices, like bananas, coffee, and palm oil. Twenty years later, even more incentives were added to get farmers to move away from coca production. Now Colombia produces about 11 percent of the world's cut flowers, and holds over half of the American market. With industry growth has come scrutiny of the huge effect this industry has on Colombia's people and natural resources. Water consumption and pesticide use was hardly an issue in the early, unregulated stages of the industry. But with a modernized work force have come increased calls for safe working conditions and environmental stewardship. As growers try to be more careful with the use of pesticides, they are putting a lot of effort into the study of diseases to learn ways to eradicate them with less danger to workers and watersheds. In one such effort, the Agro-Industrial Research Center at Jorge Tadeo Lozano University has begun a study of the variables in conditions that support peronospora sparsa, a fungus that causes downy mildew on roses. 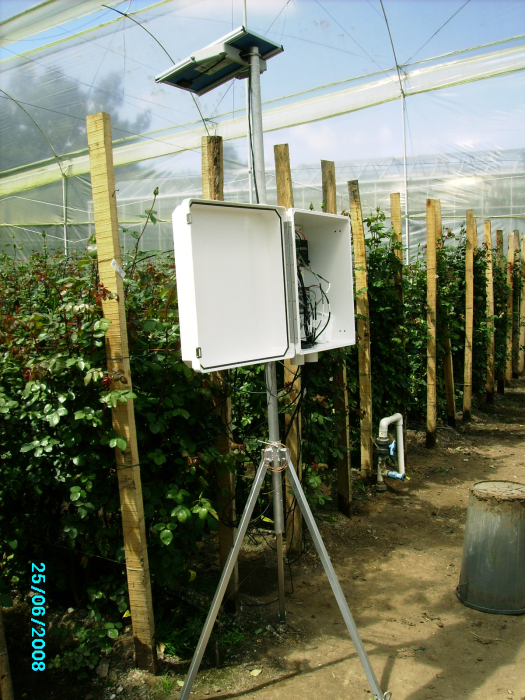 To set up the study, researchers built two measurement stations to monitor the conditions in greenhouses where roses were growing. The stations, powered by solar panels, included several Decagon LWS Leaf Wetness Sensors and Apogee SI-111 Infrared Radiometers positioned at a variety of locations among the plants. These sensors were connected to Campbell CR1000 dataloggers via our AM16/32 multiplexers. The instruments, power supplies, and enclosures all came from Campbell Scientific and were configured by Durespo, Campbell's local sales representative in Colombia. The focus of the study was on conditions that increase the fungus's growth. If those conditions can be better understood, growers can control them to curtail fungus growth. Then they can cut back their dependence on pesticides and reduce workers' exposure to dangerous chemicals. As the measurement and analysis period continues, the university hopes to generate a model that will allow extrapolation of their findings to the extensive rose crops across Colombia's Bogota Savannah.